If you happen to be the proud owner of a Windows Phone, and on occasion go travelling, you might like to make use of the Unit Converter+ app for Windows Phone devices, which boasts as being the most customisable conversion application on any platform, supports currencies, and is an exclusive mobile app on Windows Phone, along with being the only app that enables the user to define your own set of units to convert to and from. 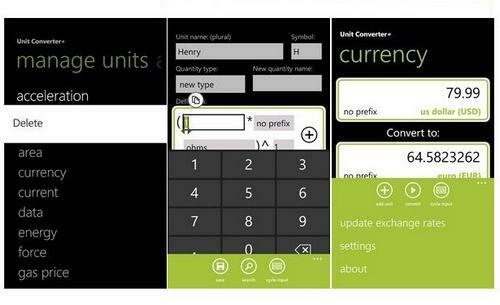 The Unit Converter+ app for Windows Phone allows both new units and quantity types that can be defined via combinations of existing units, and the application auto-calculates the conversion factors for all new units enabling the user to quickly return to converting. The Unit Converter+ Windows Phone app version 1.3, currencies have now been integrated into the mobile app allowing numerous customisation possibilities, and unit definitions can be built using currencies ($/gal), the ability to create and convert any unit or quantity, with 150 currencies available, and 19 pre-loaded quantity types. The Unit Converter+ app also includes a fast and easy metro user interface, the option to choose from multiple input scopes, search the web via the app, and a formula parser that evaluates string formulas entered into text boxes. For those Windows Phone faithful out there that would like to take advantage of what the Unit Converter+ app has to offer, there is a fully functional ad supported trail version available from the Windows Phone Market Place, or you can purchase the ad free app at a cost of $0.99.